Supreme Court ruling threatened the program’s survival, she saved and even expanded it. The career of ASEE’s 2017–18 president, the first female African-American to hold the title, offers multiple examples of seizing unfamiliar challenges, overcoming obstacles, and building durable institutions with the capacity to change lives. Along the way, this no-nonsense trailblazer has made a lasting impact on students at Virginia Tech, where she is a professor of engineering education and associate dean for academic affairs, and become a leader of—and role model for—champions of diversity in ASEE and beyond. If success in engineering for women, blacks, Hispanics, LGBT students, and those with disabilities is a matter of social justice, Watford has an additional take. She’s fond of quoting Bill Wulf, former president of the National Academy of Engineering, who contended: “Diversity is essential to good engineering!” Varied life experiences of men, women, people from different ethnic backgrounds, and the handicapped, he argued, represent “the gene pool out of which creativity comes, out of which elegant engineering solutions come.” Within ASEE, Watford grew frustrated when nothing came of a 2002 diversity plan. When she later chaired a Society Diversity Task Force, she made sure that it resulted in a strategic plan, a standing committee, and a website. Graduating in 1981, Watford contemplated doing an M.B.A., but a faculty member urged her to consider a graduate degree in industrial engineering and operations research. She met Prof. Timothy Greene, who had just received a grant to study coal transportation from West Virginia to Norfolk, Va. Trouble was, Greene didn’t know anything about coal—“not a dang thing”—so he hired Watford and served as her adviser for both her master’s and Ph.D. She was the first black female from the College of Engineering to earn advanced degrees in those fields. 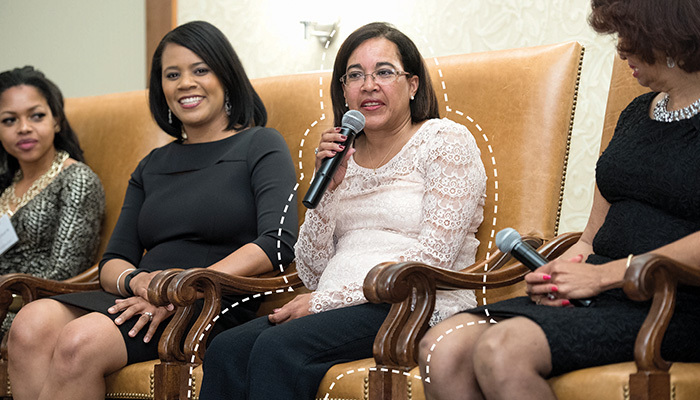 Watford began with a peer-mentoring program for black students before expanding her initiative to include similar programs for women and Hispanics. She is particularly proud of Hypatia, a living-learning community of 300 women who live and work together in engineering. In the first year after it was created in 2001, the graduation rate of female engineering student participants increased by 20 percent. She also spearheaded Imagination, a one-week math and summer camp for seventh and eighth graders to do hands-on activities with science and technology; a Pre-College Initiative (a collaboration with Virginia Tech’s National Society of Black Engineers chapter) that includes five daylong events to help students prepare for the college application process; and Women’s Preview Weekend, which enables women who have been offered admission to the College of Engineering to spend a weekend staying in residence and meeting people from the community. The whole program was almost dismantled following the Supreme Court’s 2003 decision in Grutter v. Bollinger, launched by a white student who contended she had been denied admission to the University of Michigan Law School because of race. While the court sided with Michigan, the ruling prompted institutions to rethink programs aimed solely at minority students. Virginia Tech rallied, expanding the program to include every student and renaming it the Center for the Enhancement of Engineering Diversity (CEED). Now, instead of supporting 350 to 400 students, CEED caters to a majority of the entire freshman class of more than 1,300 students. Richard Benson, president of the University of Texas at Dallas who was Virginia Tech’s engineering dean from 2005 to 2016, found out firsthand about the inclusive nature of CEED. “I’m a white male with a white male son who just graduated from Virginia Tech this May. Like a lot of new students, he found engineering tough and he needed help—and he got it from some of the superb programs that Bev has put into place. I was already a fan, but it was pretty powerful to revisit those programs through the eyes of a father.” He adds, “Bev is absolutely the best in making sure that students achieve success. Her son, Devon, graduated from Virginia Tech and daughter, Leah, next year, and Bev has almost a mother’s interest in kids doing well. She has had a colossal impact on student success at Virginia Tech.” Just before he left Virginia Tech, Benson was instrumental in Watford’s receiving the school’s 2016 Presidential Principles of Community Award. While veering away from the research-and-publish grind early in her career, Watford found a niche in scholarship by collecting data and documenting results of her Virginia Tech initiatives and pulling in millions of dollars in external funding. She twice served as a NSF program director, most recently of the Broadening Participation program within the Division of Engineering Education and Centers, and is profiled along with other “pioneers” of engineering education research by the University of Washington’s Center for Engineering Teaching and Learning. Among Watford’s goals as president, as spelled out in her Candidate’s Statement, is to build on ASEE’s relationships. “I see the president as having a key role in enhancing partnerships with strategic organizations to achieve real and lasting change,” she wrote. On receiving the gavel, she announced that ASEE will co-host the First Annual Conference of the Collaborative for Inclusion and Diversity in Engineering and Information Technology—a conference intended to bring together all those working to achieve increased participation for underrepresented groups. This promises to be an active year. Freelance writer Pierre Home-Douglas is a regular contributor to Prism.